Movie Review: “Man From Reno”, a bewitching independent neo-noir film, may trap you in its mysteries and moods while transmits all the anxiety and uncertainty that its characters are subjected to. This is the second time (the first was “Daylight Savings” in 2012) that the screenwriters Joel Clark and Michael Lerman join efforts with the co-writer and director Dave Boyle. They were able to fabricate a wonderful story, set in San Francisco, and involving a popular Japanese writer from Tokyo, Aki (Ayako Fujitani), who in the face of a creative/identity crisis, decides to stop writing and vanish during her press tours in the city. After an unenthusiastic meeting with some old friends from college, she stealthily checks into a hotel, where she meets an astute, seductive, and handsome man called Akira Suzuki (Kazuki Kitamura). Aki feels so lonely and depressed that she ponders for several times about using the razor she carries in her purse to kill herself. It’s Akira who cheers her up and gives her the confidence she needs to overcome the present situation – a sort of a new breath that soon collapses since he’s not the man she thinks he is. After sleeping with her, Akira disappears without a word from the hotel, leaving a suitcase and a trail of mysteries behind. From this moment on, Aki starts being followed by enigmatic individuals who scarcely are whom we think they are. In parallel, San Marco County’s sheriff, Paul Del Moral (Pepe Serna), runs over a nameless Asian man, after spotting an abandoned car, and starts to investigate his disappearance from the hospital where he was taken. Later on, he’s informed about a dead body found in the river shore. The man, in spite of identified as Akira Suzuki, is not the same as the one who met Aki in the hotel. The determined sheriff and Aki, who is guided by an acute intuition gained in her books, will try to search for something palpable in order to solve the puzzle. 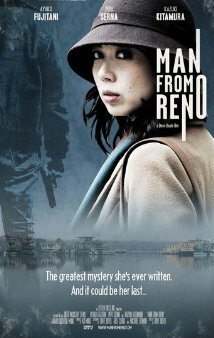 Sometimes vague and disorienting, sometimes precise and self-assured, “Man From Reno” plays with your curiosity in a complex, thrilling exercise, which not being totally satisfactory, presents strong elements to compose a solid detective story. This includes inexplicable clues, secret words, dangerous chases, mistaken identities, undercover paparazzis, an eerie soundtrack, and a constant, if subtle, tension associated to its Hal Hartley-esque conspiracy.